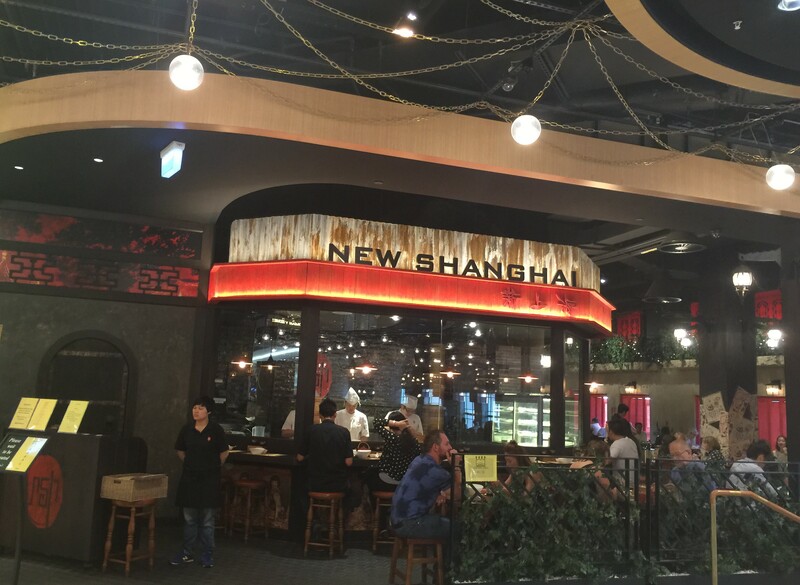 New Shanghai is a Chinese restaurant located on lvl 3 of the Melbourne Emporium. The food is based around traditional recipes that have been passed down the line from generation to generation. 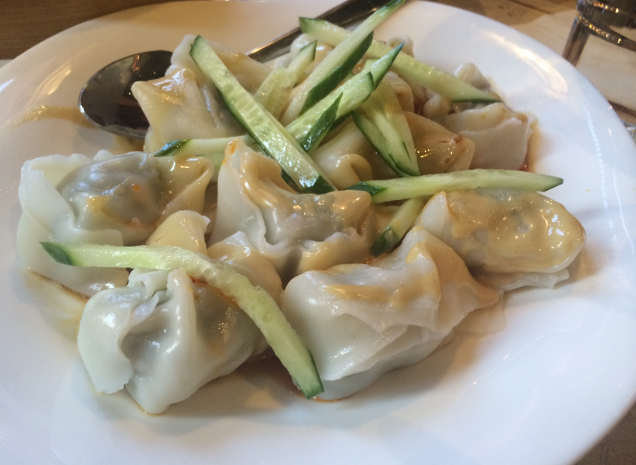 And by golly they sure know how to make good dumplings. The dumplings are made fresh on site, you can see them hand crafting the little dumplings right in front of you. 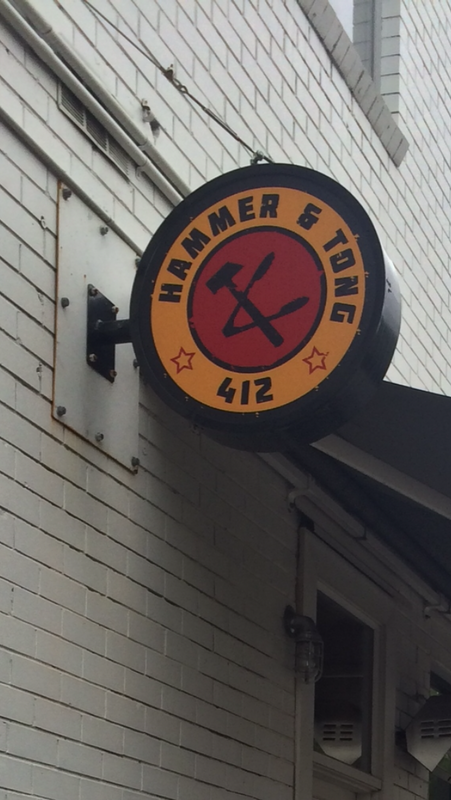 If you dig dumplings, this place is a MUST. 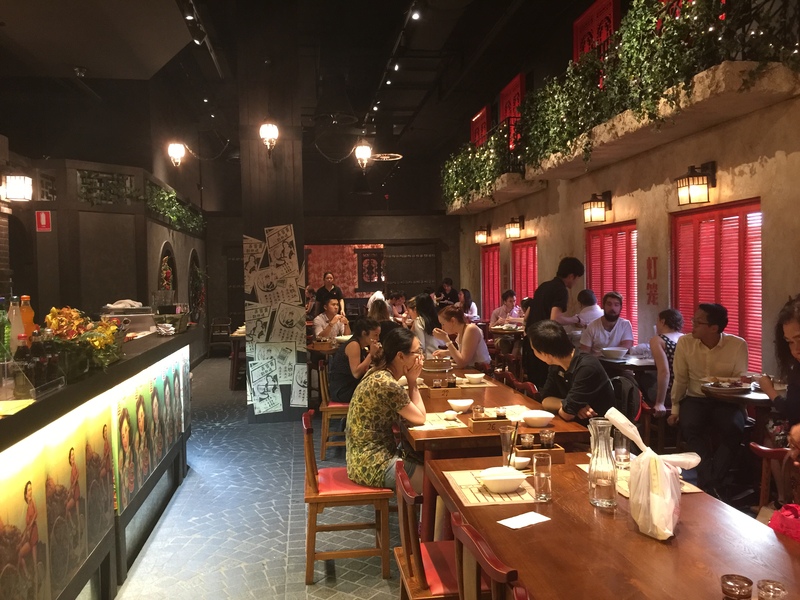 Alongside the glorious dumplings New Shanghai has a delicious menu of a variety of authentic Chinese dishes at reasonable prices, which will keep you coming back for more. 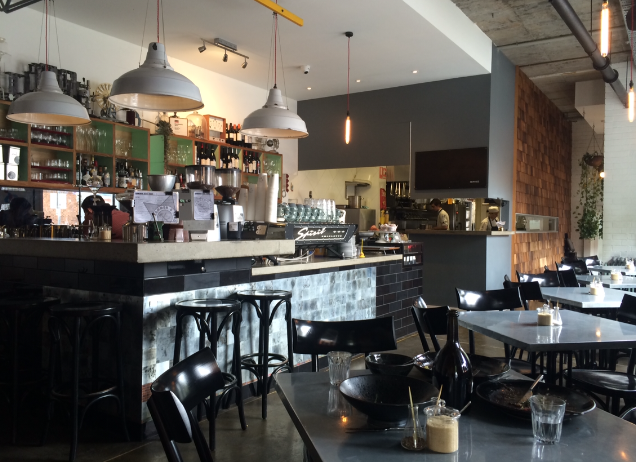 While the recipes are traditional, the restaurant décor has a very modern vibe. They have a variety of drinks on the menu. 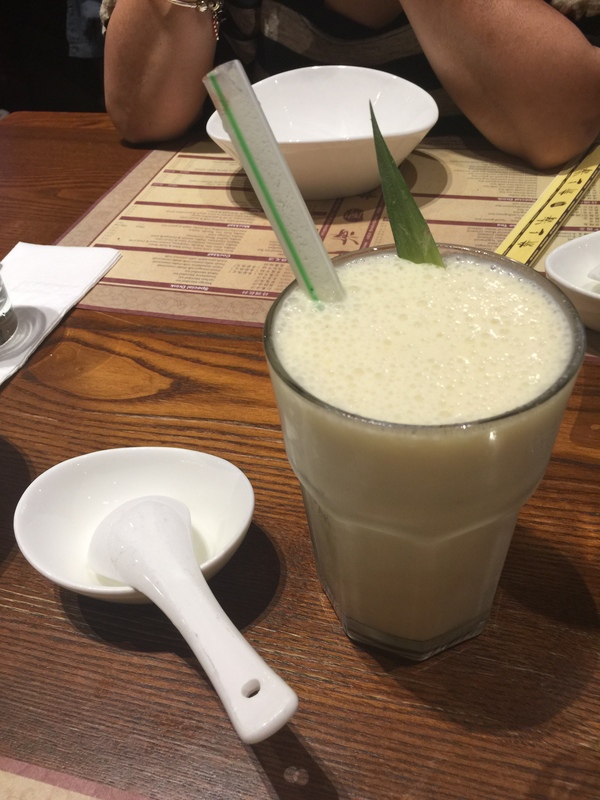 The fresh pineapple and coconut milk was delish, it was like a milkshake and tasted really fresh. The honey green tea is good too. It’s green tea but has the mouth feel of a crisp cold beer. It’s tastes clean and refreshing. 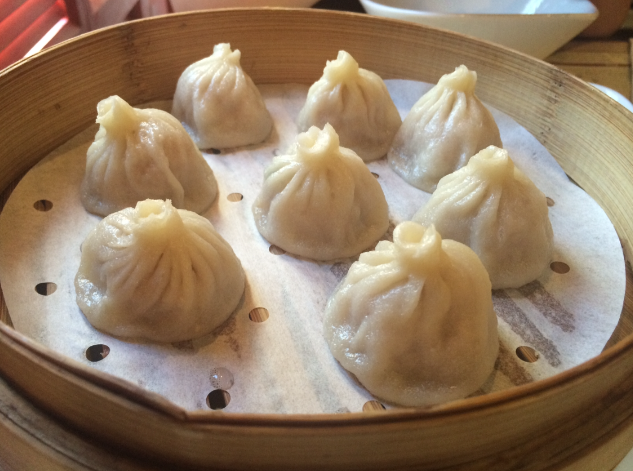 New Shanghai’s dumplings are beyond delicious. They deserve a standing ovation bravo bravo! The xiao long bao are one of my many favourites at New Shanghai, the skin is thin and soft and the pork and hot soupy filling is incredible. Add a little bit of vinegar and they are just perfect. Another favourite of mine is the pan fried pork buns. The first time I tried these I was in awe of how amazing they were. 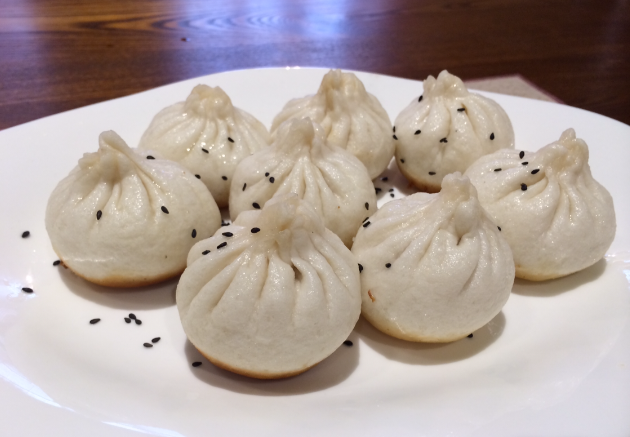 They are in the shape of the xiao long bao and the filling is the same as the xiao long bao, but the skin is thicker and sort of cakey like BBQ pork buns. 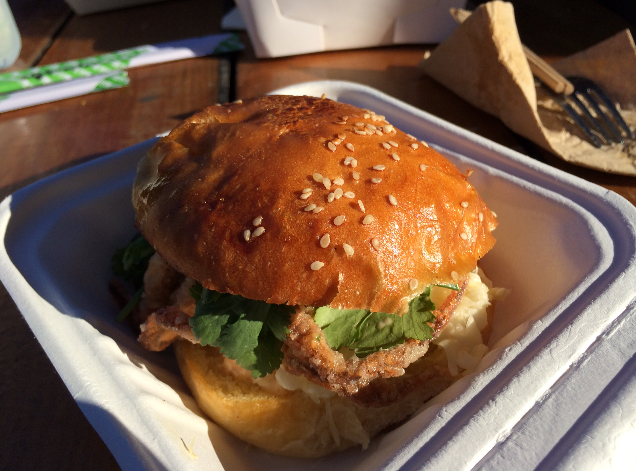 The pan fried pork buns are fried and have a golden toasted crispy bottom. They are truly remarkable. The pan fried pork dumplings are delish too. 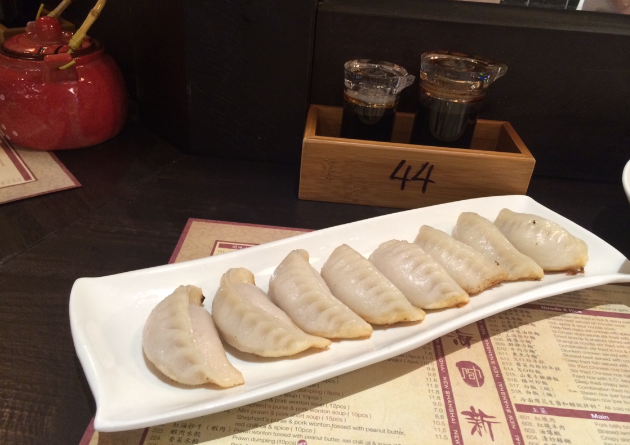 The dumpling is fried and the skin is a little thicker and a little sticky in a good way. Delish! The shepard’s purse & pork wontons have the most amazing skin. The skin is thin and super silky, glossy and amazing. They were sitting in a spicy red chilli oil and had a peanut sauce drizzled over them. I couldn’t get over the skin on these wontons, they just had such an amazingly smooth texture. 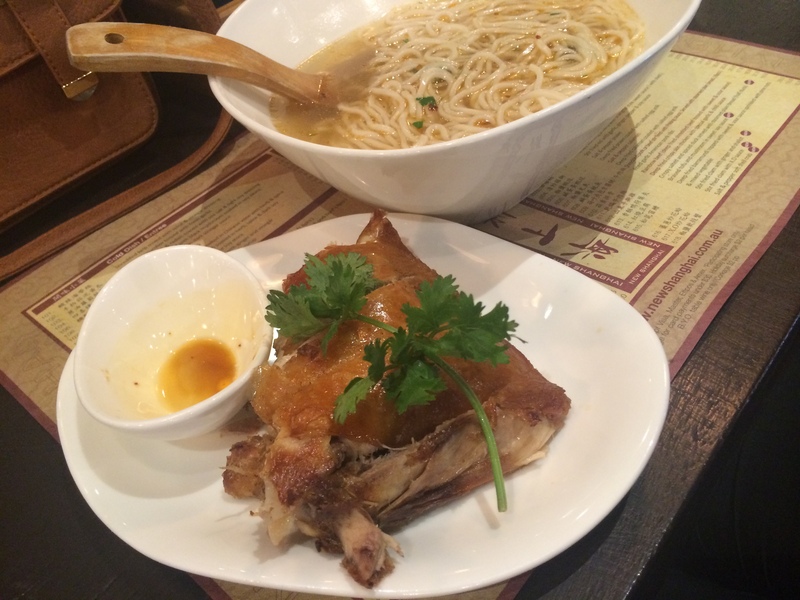 The noodle soup w deep fried crispy skin chicken is really tasty. The soup has a subtle flavour and comes with a spicy vinegar sauce to add more of a kick. 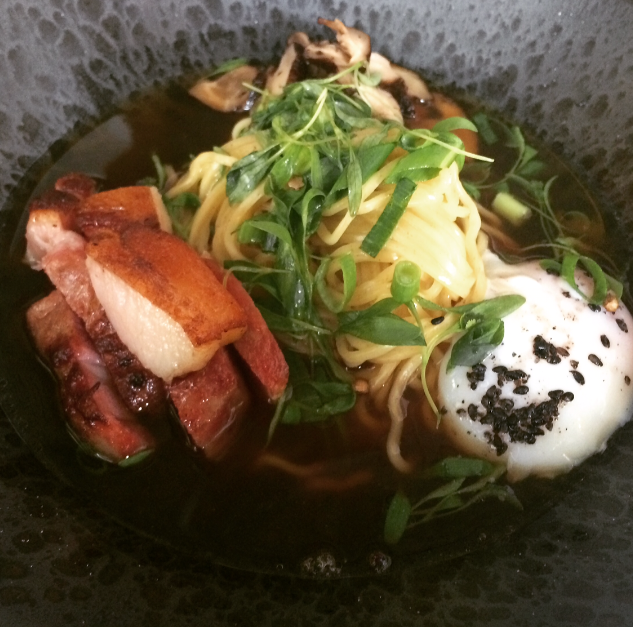 The noodles are fresh and the crispy skin is uber crispy. Yum! 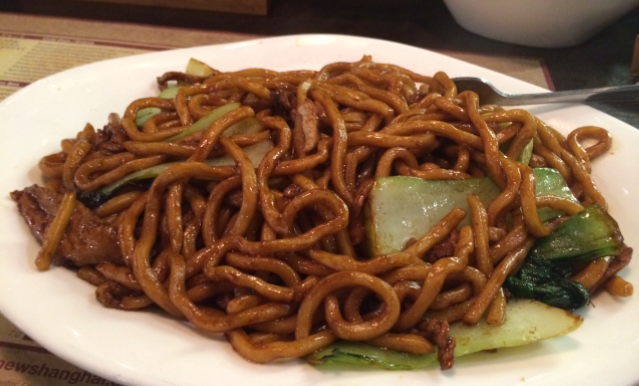 The fried Shanghai noodles are full of flavour and stir-fried with a sweet soy based sauce, shredded pork and bok choy. They are the thick round egg noodles (sort of like udon). Very tasty and a little bit slippery, if you are not a chopstick pro you may need a fork for these. 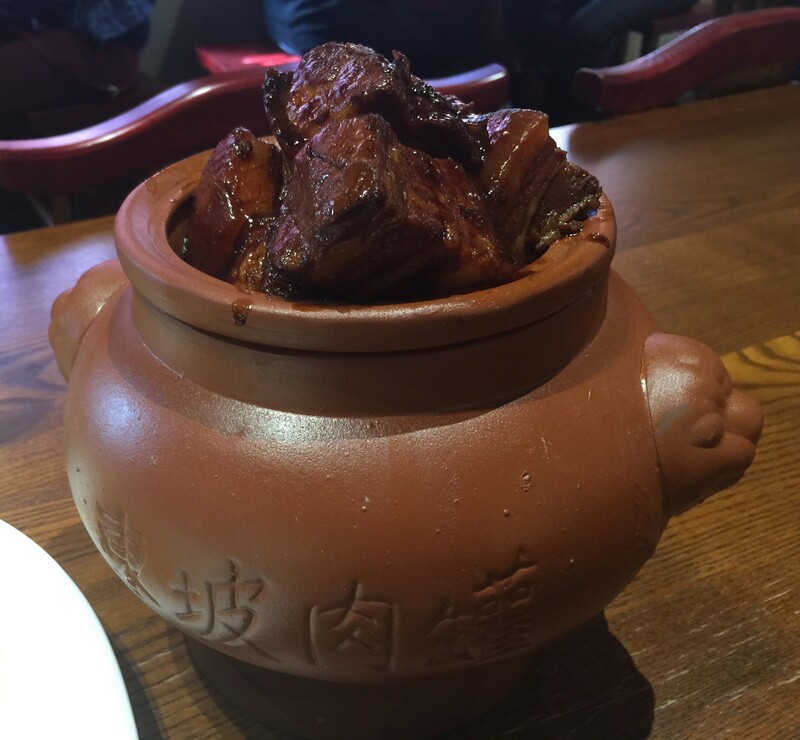 The braised pork belly arrived in a big clay pot, it looked very traditional and was overflowing with giant chunks of juicy pork belly. The pork belly was marinated and covered in a sweet soy sauce and melted in your mouth. The deep fried tofu w salted egg yolk was yum. 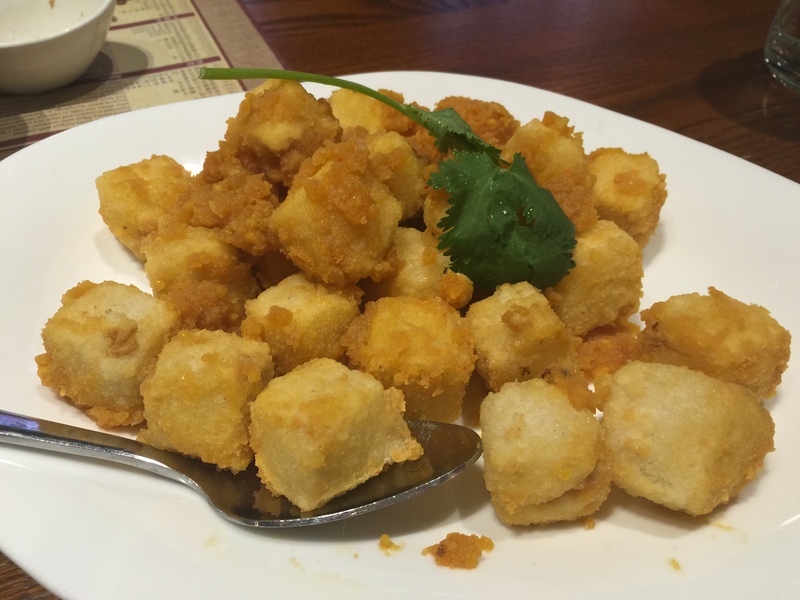 The tofu had a light crispy batter and the tofu was really soft and silky in the middle. The salted egg yolk added flavour and a powdery-like texture to the dish. It was nice. 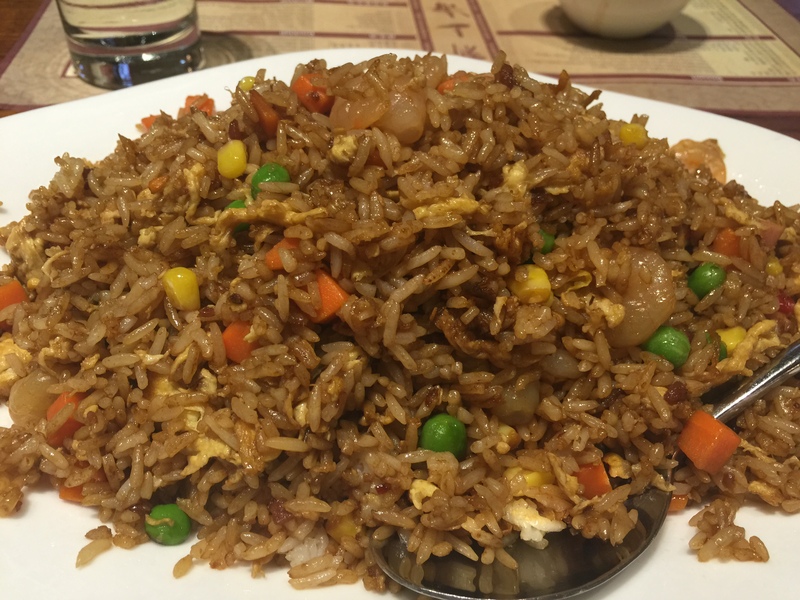 The fried rice with X.O sauce was delicious. It was your standard fried rice, fried up with X.O sauce. This simple alteration made the dish much tastier. The X.O sauce added that spicy seafood flavour which intensified the flavours in the rice. For dessert we tried the pumpkin sticky rice cakes w red bean paste. Firstly awww they looked like little pumpkins. So adorable! 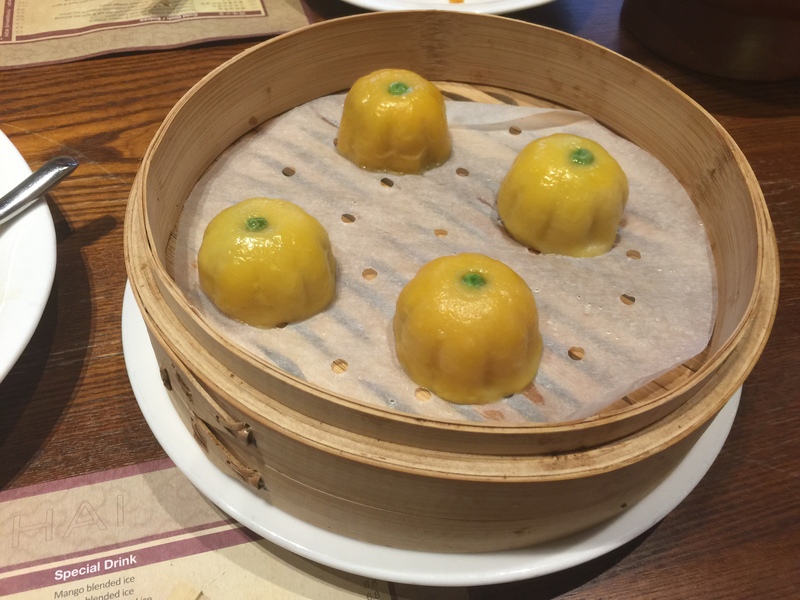 They were steamed and came out in a bamboo steamer like dumplings. They were soft and a bit sticky and were a great dessert to end the meal. 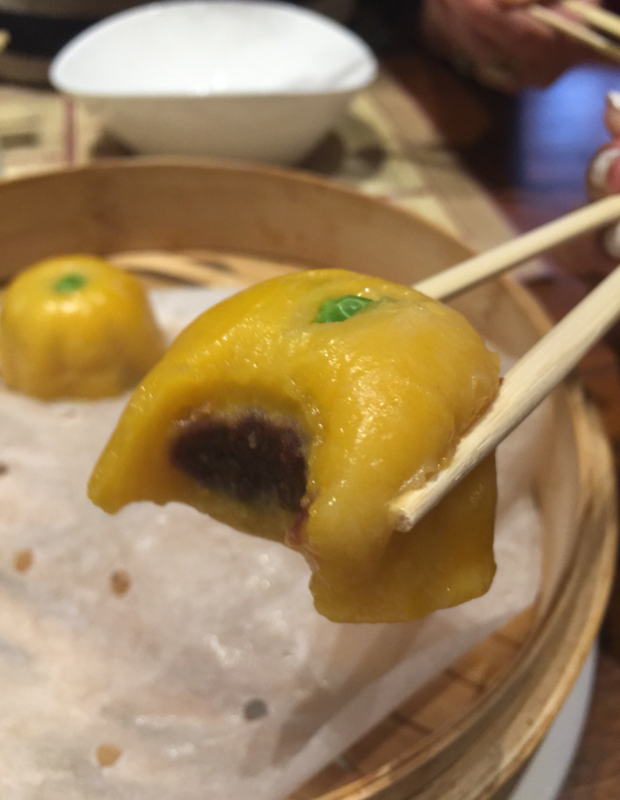 They were like sweet little glutinous pumpkin dumplings filled with a sweet red bean paste. I loved them! New Shanghai has a delicious menu of authentic Chinese food. Their service is good, the prices are reasonable, the food is delicious and the servings are generous. It’s a great place to gather a group of people and order a bunch of share plates. Also I like to go on my own so I can have a plate of dumplings all to myself. 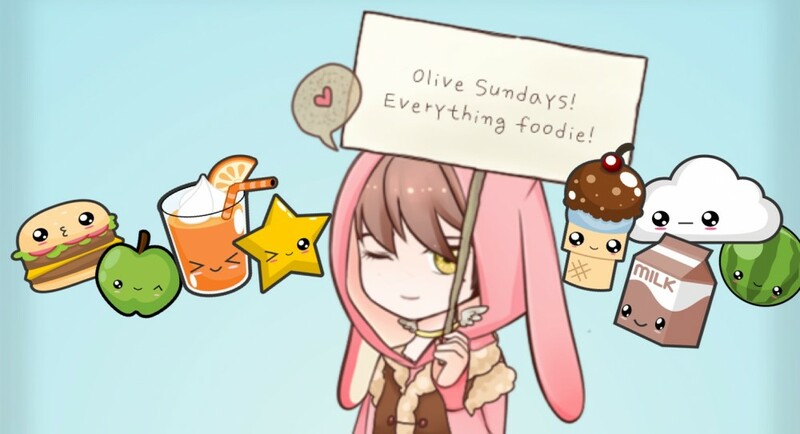 Note: Olive Sundays was invited as a guest to New Shanghai. On a weekend Merchants Guild has people out the door queuing to eat and while it doesn’t take too long to be seated, the quality of food is completely worth the wait. 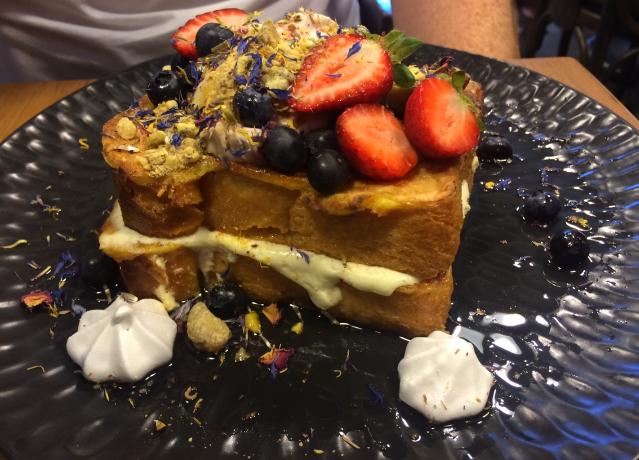 This breakfast/lunch eatery is located in Bentleigh East and has some real winners on the menu. Whenever I leave I am already planning on when to come back. 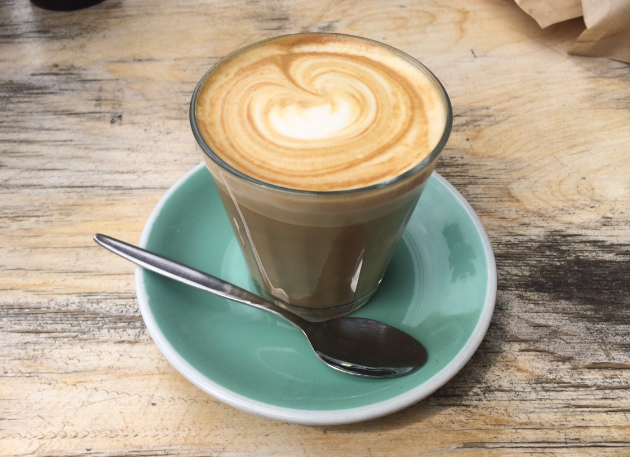 They do a great coffee, and for those chai tea lovers out there, they do a really amazing chai. The food is just yum, yummy yumness on a plate. The décor has a modern and environmental feel about it. Open kitchen, open space, micro herbs growing in a big fridge. 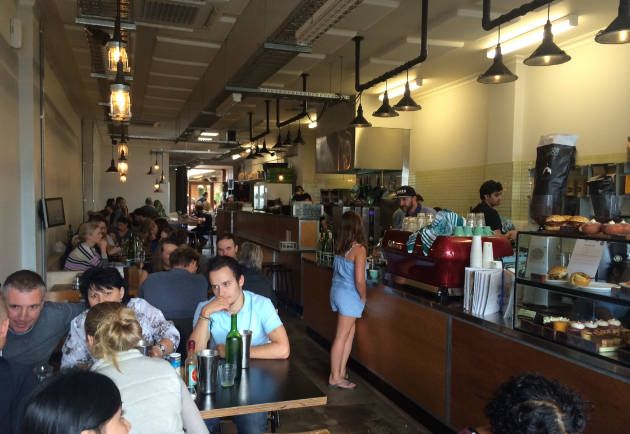 It has a positive, busy, vibey ambience. 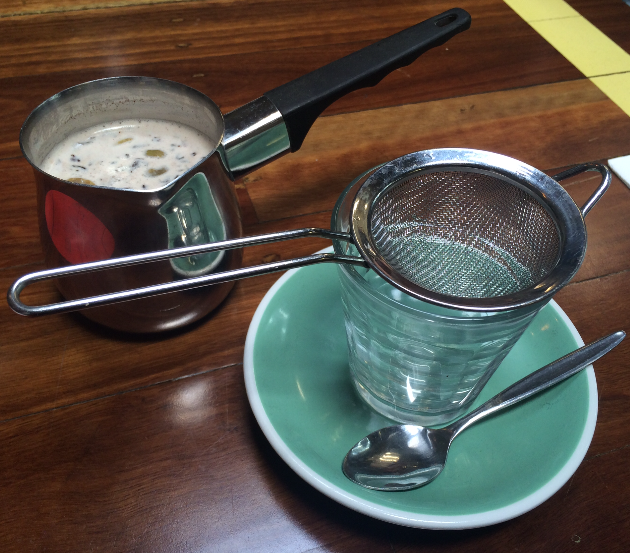 The first time I visited I tried the Prana chai because I had heard great things about it. I was not disappointed. It was full of flavour, really creamy, really spicy, really balanced. Delish sums it up well. Not to mention adorable, it came out in a little metal pouring pot with a strainer. They have a good variety of different teas. Even their English breakfast tea is really good. And again adorable! 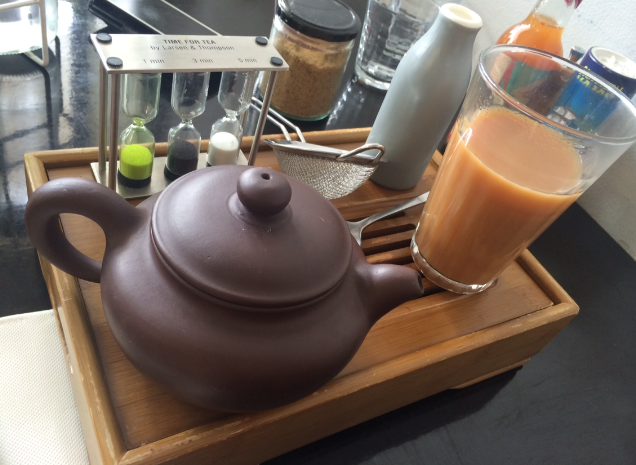 It comes out with a teapot, a glass, a little strainer, a little milk bottle and a three little hour glasses. When the last hour-glass runs out of sand it means the tea has sufficiently brewed and is ready for drinking. Too cute. They do a really good coffee too. Delish! And they also do fresh juices. My friend got a cold pressed super juice, which had apple, beetroot, silverbeet and grape she said was nice. 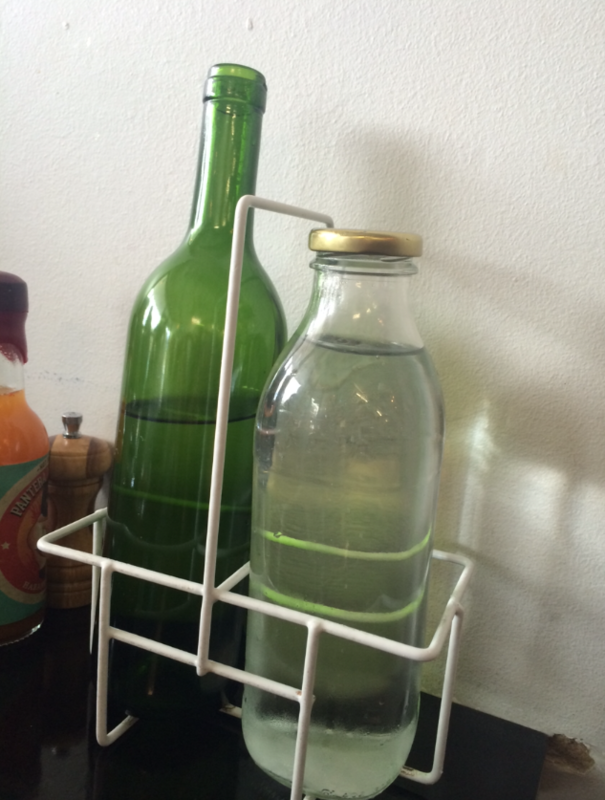 They provide everyone with a bottle of plain water and sparkling water which I think is a cute idea. The eggs panzanella was delicious. I hadn’t had panzanella before but OMFG these flavours go together like peas in a pod, like butter on bread, like burgers on brioche, like bacon and egg, like presents on christmas. It was sensational! The jamon, the basil, the dehydrated cherry tomatoes and the marinated white anchovies were incredible all together. 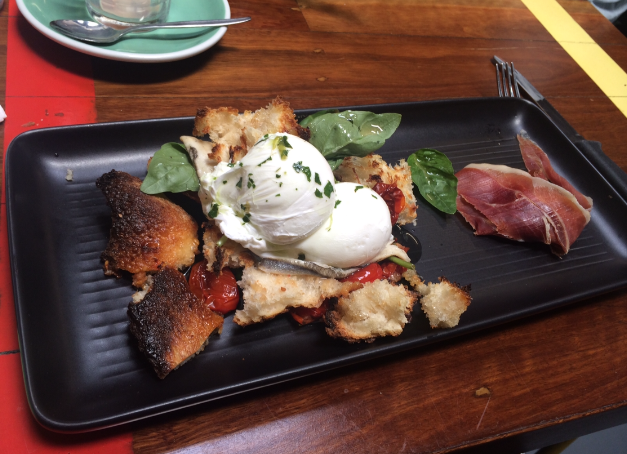 Then there were torn pieces of bread fried up like giant rustic croutons, which were crunchy and toasty and soaked up all of the flavour and the egg yolk (eggs were poached perfectly btw). It was delicious! 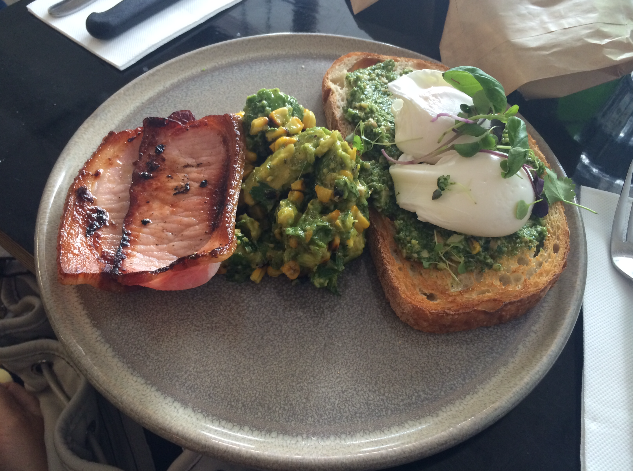 The short cut bacon with an avocado and charred corn salsa on sourdough with eggs and jalapeno pesto is popular and for good reason. The bacon is yum, it’s a delicious thick piece of short cut bacon. The avo and charred corn salsa is amazing and tastes really creamy and fresh it’s got a bit of zing. The jalapeno pesto is yum (not hot but tasty) and is spread over the sourdough with eggs on top. It’s a really fresh and tasty meal. 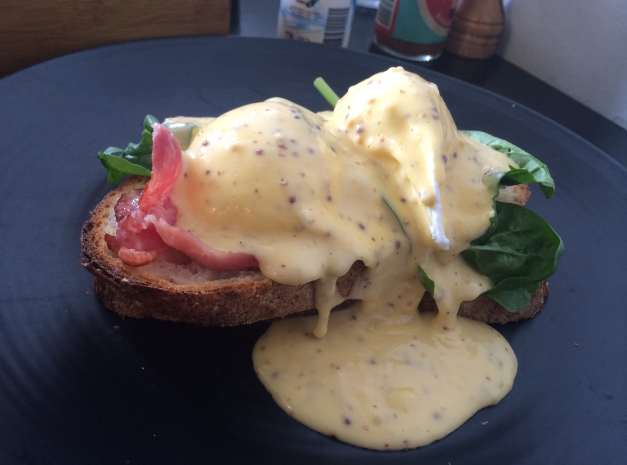 With their eggs benedict they have a changing hollandaise, which is fun. When they bring the menu out they usually tell you the hollandaise of the day along with the soup of the day. I had the seeded mustard hollaindaise and it was absolutely scrumptious. It would definitely be up there in my top hollandaise sauces of all time. It was creamy and smooth and moreish and delicious. It was grand. And then with the eggs, the smoked ham hock and a bit of spinach, it was just heaven. 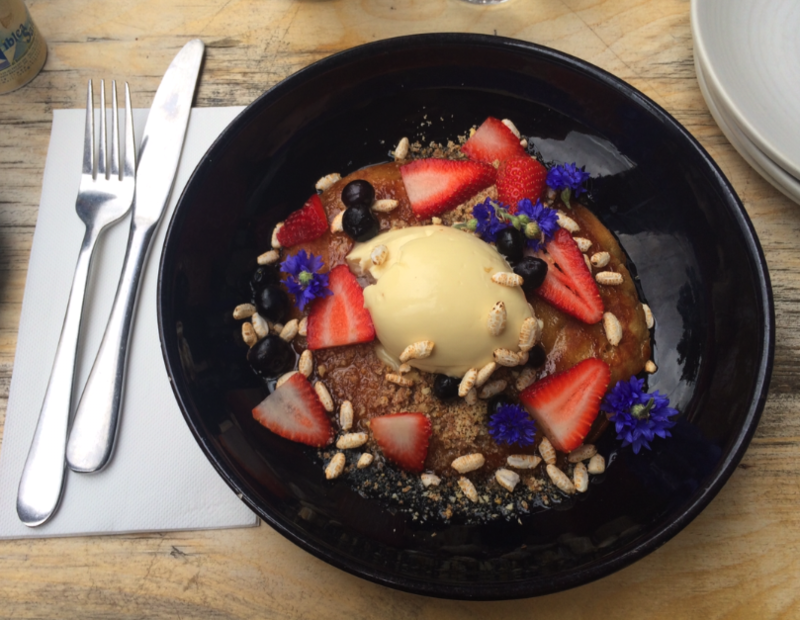 The raspberry pancake looked really pretty, it had a big scoop of maple mascarpone in the middle and vibrant blue flowers, fresh berries and puffed rice scattered on top with a sprinkle of gaytime dust. The pancake was soft and fluffy and smothered with maple syrup so it was super sweet but if you eat a little bit of everything together it balances out the sweetness. The raspberry jam and fresh berries are tart and the mascarpone was creamy. The gaytime dust and the puffed rice added texture. It was yum but gosh it was filling. 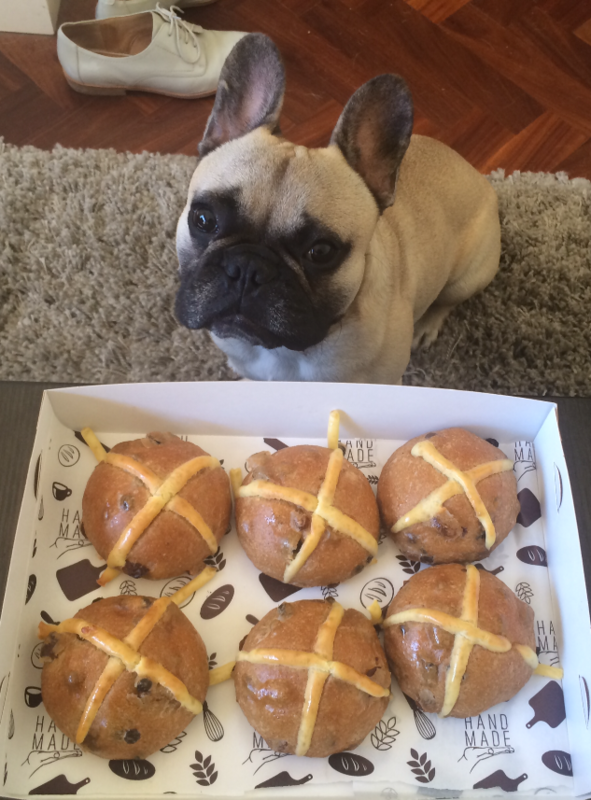 Eyes on the prize. 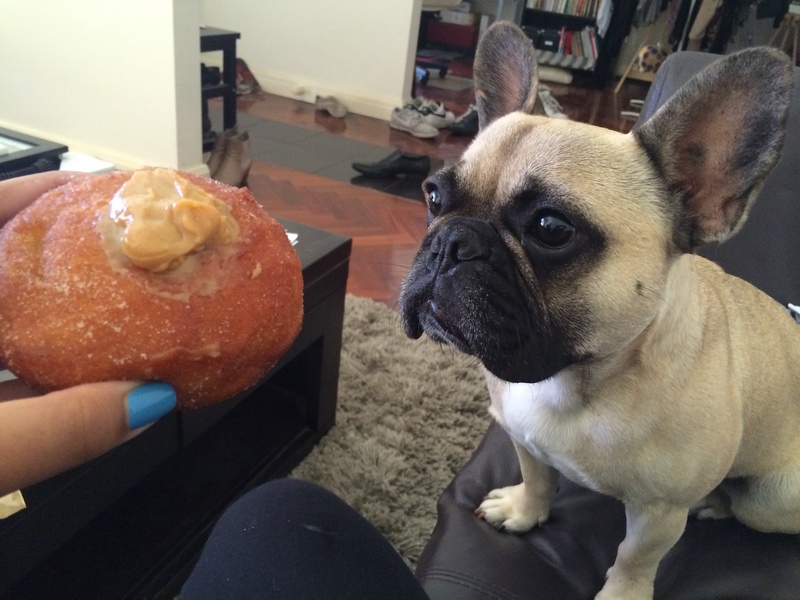 Max had his heart set on the salted caramel doughnut the moment he laid eyes on it. They also do a white chocolate cheesecake filled doughnut and a lemon curd one too. Yum! 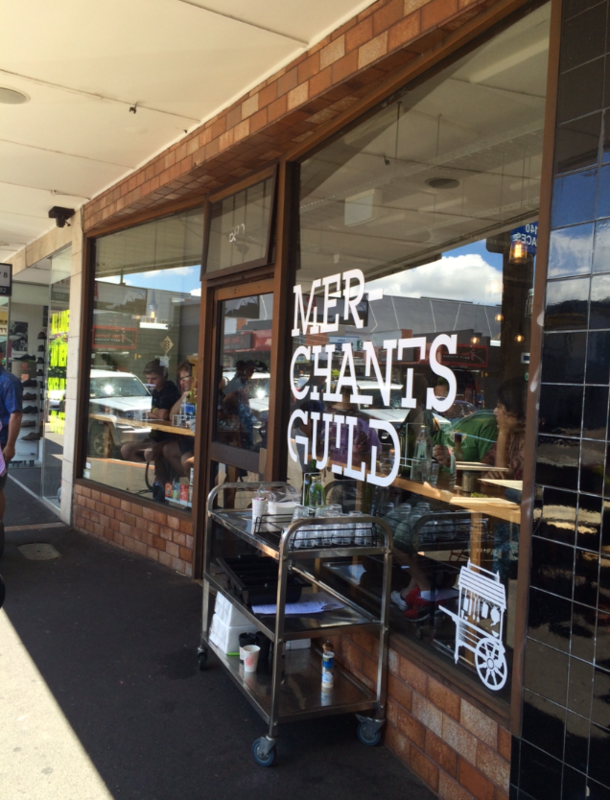 At Merchants Guild everything is made with love and you can taste it. 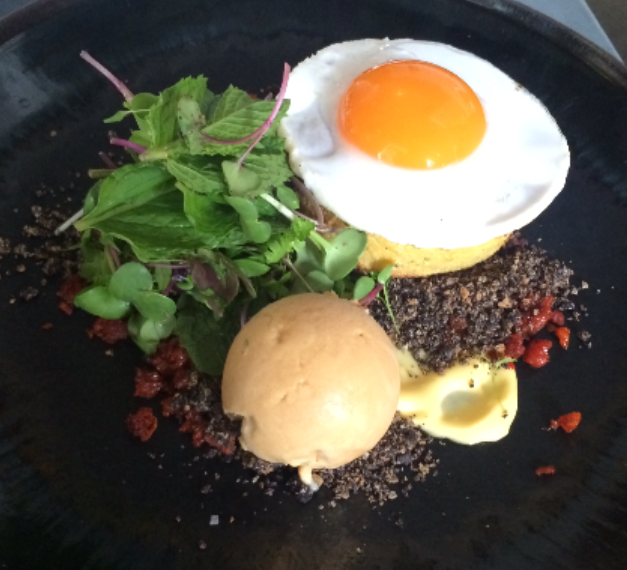 The quality produce and the care taken into creating the menu and presenting the dishes is nothing short of amazing. 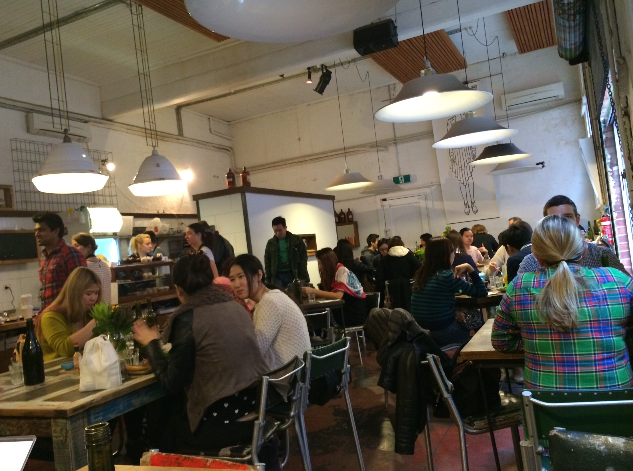 Weekends are really busy but it’s managed really well so you are seated pretty quickly. I’ve only ever waited about 10-15mins. And it is well worth the wait. 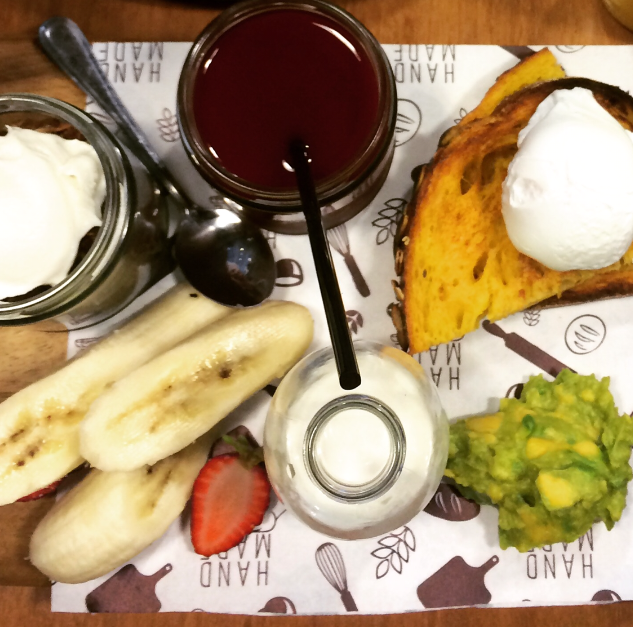 Perfect place for brunch, it’s got a great atmosphere and the food is exceptional. 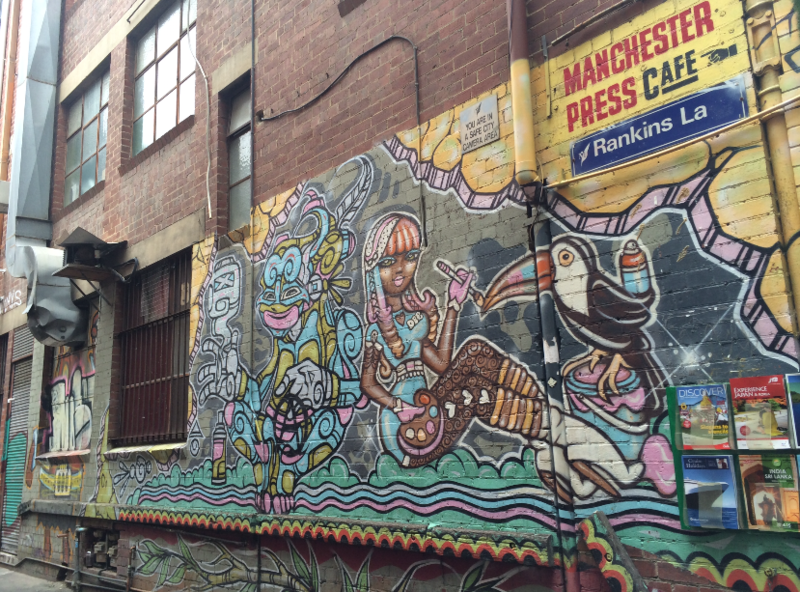 Manchester Press is a good place to grab a coffee and bagel. 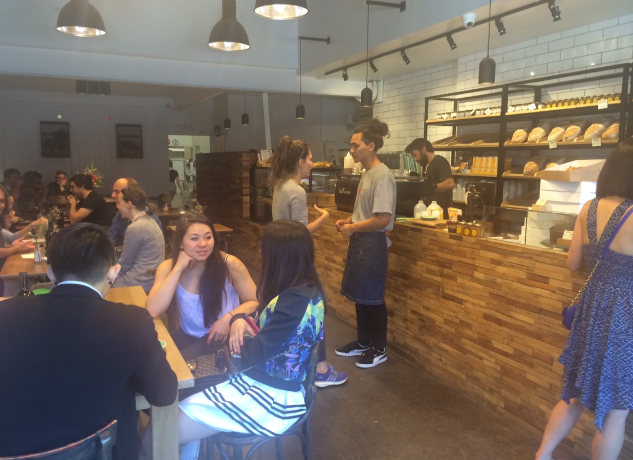 They serve good quality coffee and have an exciting bagel menu. 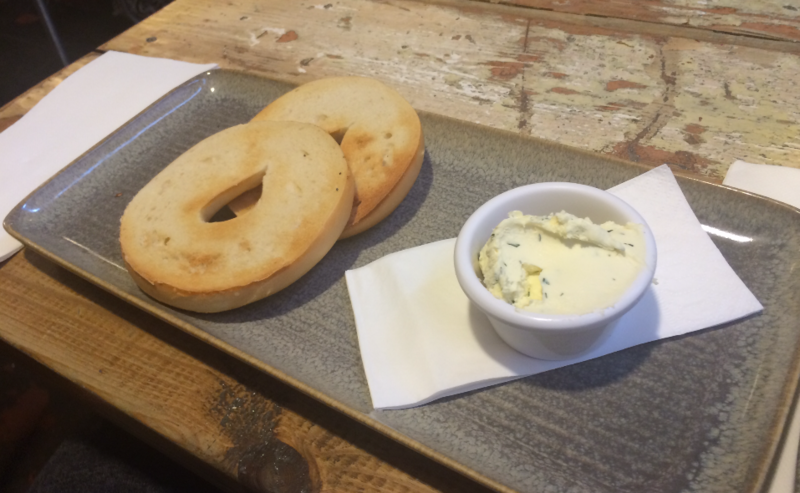 The bagels are made fresh and the quality produce and clever food pairing is what makes these bagels stand out from the rest. 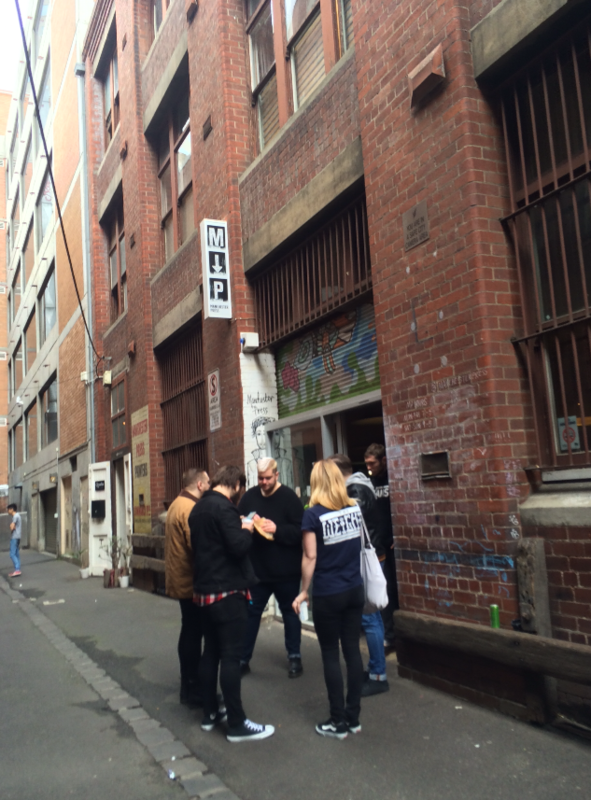 You can find this little gem off little Bourke St, down Rankins Lane. It’s a really cool venue with an arty industrial feel. There’s stuff and things around the place, which give it a lot of character eg. there was a random gigantic bowling pin in the corner behind us. 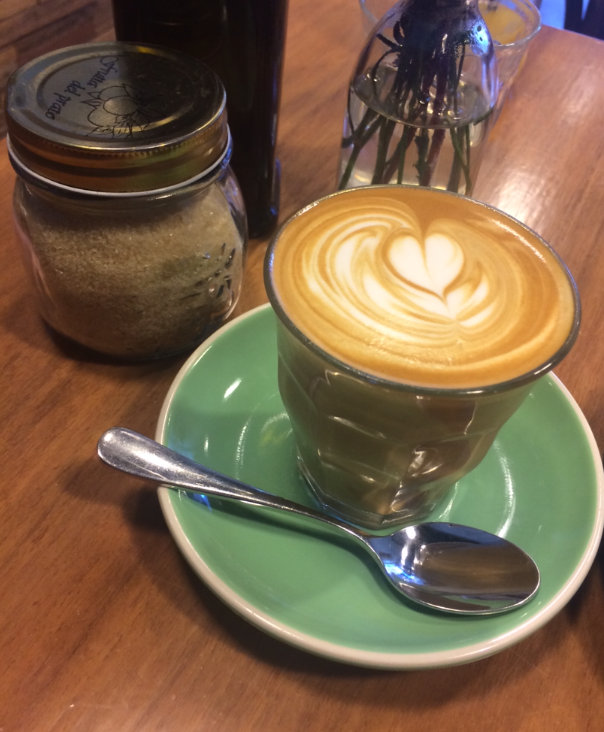 They do an awesome coffee. I almost drank it all before I stopped to take a photo. The BMAT is a similar idea to a BLT only one hundred times better. 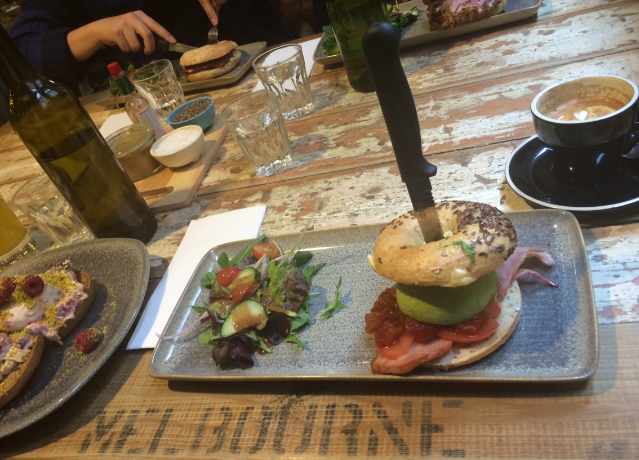 It’s bacon, mozzarella, avocado & tomato on a toasted bagel with apple & tomato chutney. It was one mother of a bagel impaled by a steak knife. The seeded bagel was layered with a thick slice of bacon, fresh tomato, chutney, half an avocado and melted mozzarella. It had a steak knife vertically stabbed through the middle which kept it all together. 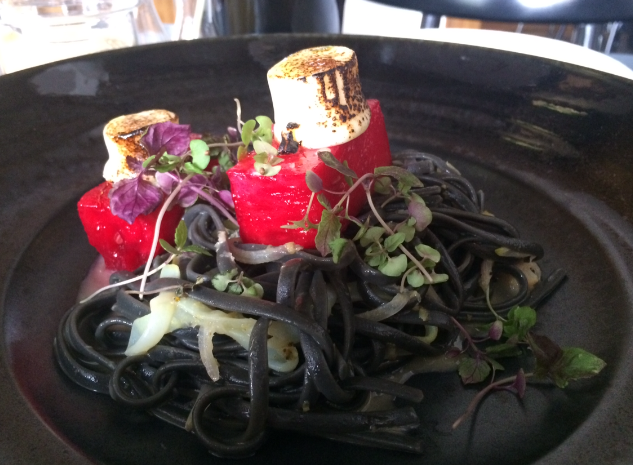 It looked impressive and the flavours lived up to my expectations. The apple & tomato chutney elevated the flavours, it was sweet, added a moistness and brought all the flavours together. I really enjoyed it. The bagels are freshly made and are deliciously dense and quite filling too. Sometimes even just the classic plain white bagel with cream cheese is a winner. 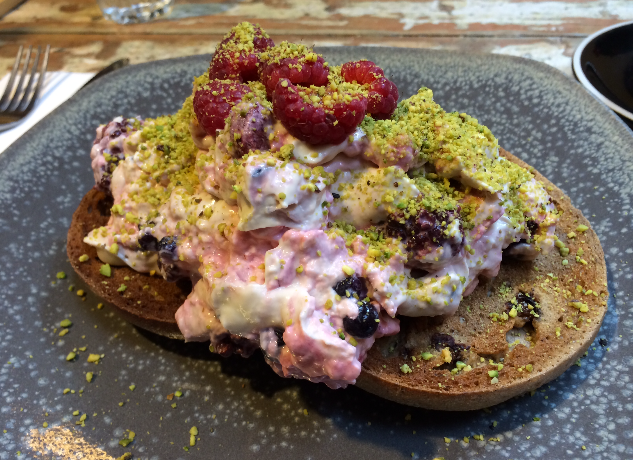 Then there was the fruit & nut bagel with a mixed berry mascarpone. Oh my holy goodness. This was absolutely delicious. 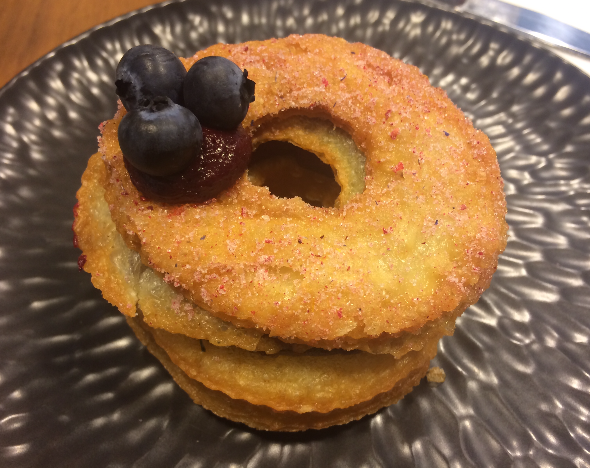 The combination of the spiced nutty bagel (which sort of reminded me of gingerbread) in combination with the creamy mascarpone with fresh berries was incredible. Through the mascarpone there were fresh blueberries, blackberries and raspberries, which added a sweet tartness and there was finely ground pistachios on top (like a pistachio crumb). The flavours and textures all together was like heaven on earth. I loved it so much. It was delicious. 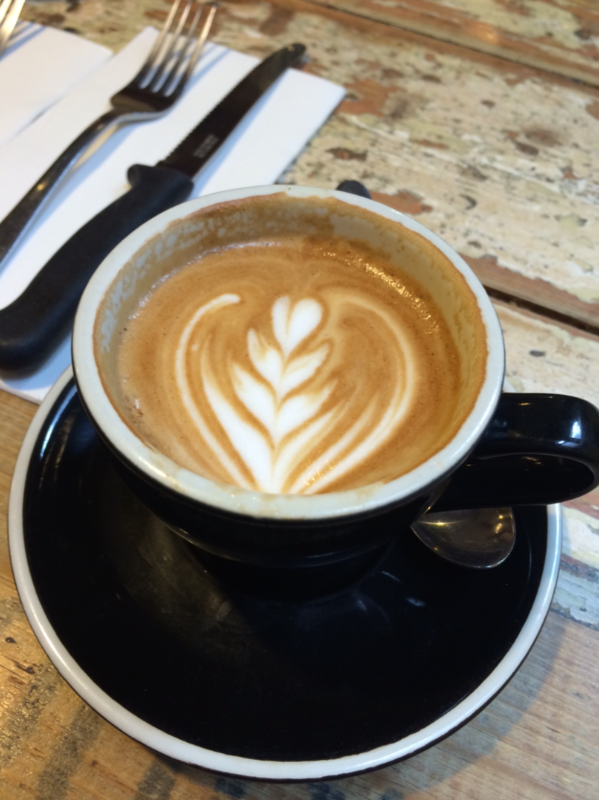 Manchester Press is the perfect place to visit for a coffee and bagel. 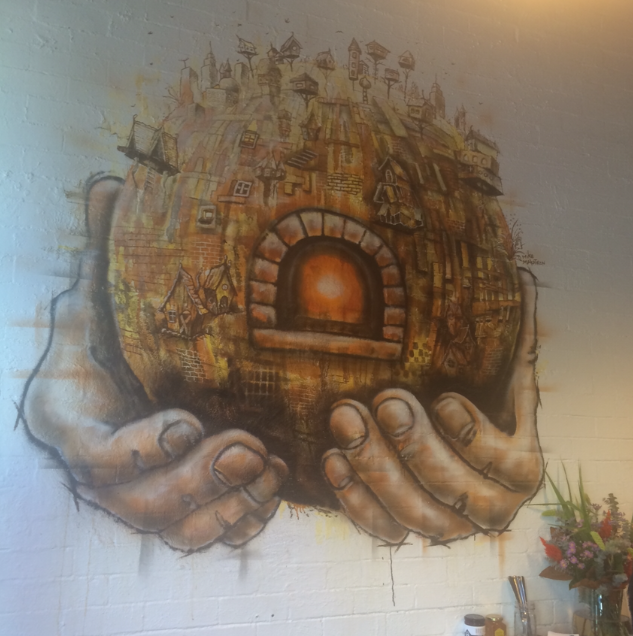 What sets it apart from other bagel places is the amazing coffee, the enticing menu and the awesome atmosphere. 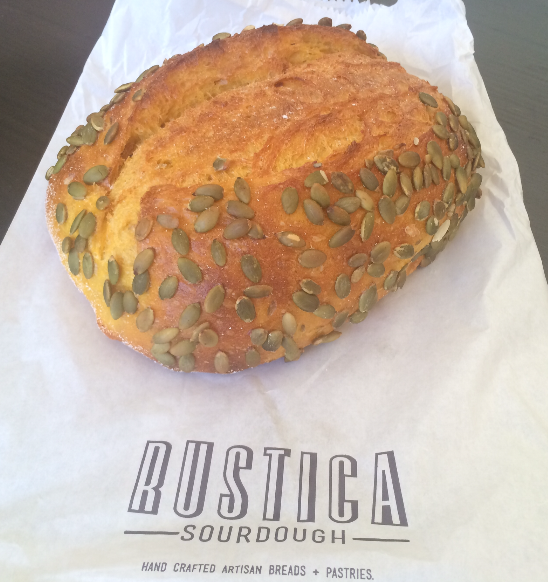 The flavour pairings are stand out and take their bagels to another level. 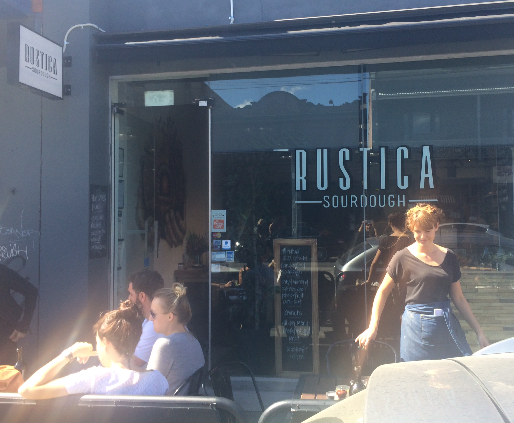 Great coffee, fresh bagels and friendly service.